Corrected Transcript, Commentary and Figure Captions Copyright © 1996 by Eric M. Jones. All rights reserved. Last revised 14 August 2016. 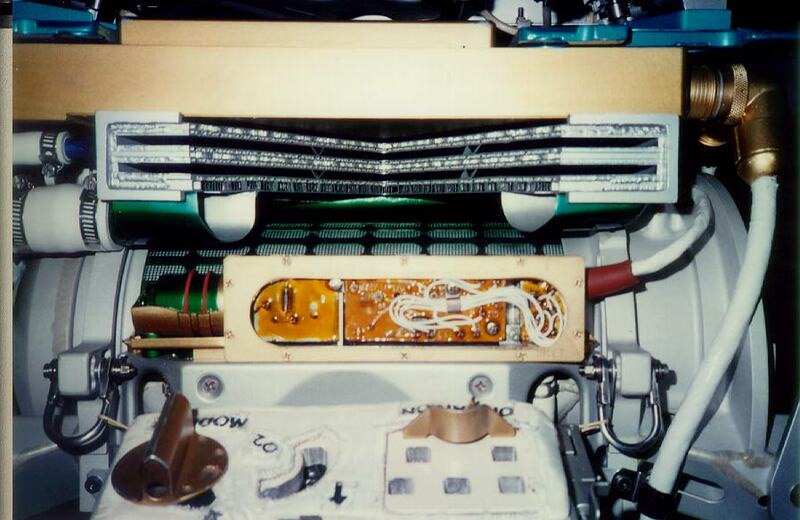 Unless otherwise noted, these photos are cutaway views of a full-scale, engineering model of the Portable Life Support System (PLSS). The colors of the internal components are used to enhance the identification of critical components only. Production models were not color coded. In these pictures, we will use the convention that the "front" of the PLSS is the side that rests against the astronaut's back. Most of these photographs were taken from the "front", and, therefore, "left" to the viewer is the astronaut's "right". Except where noted, the photographs were taken by Journal Editor, Eric Jones, and were scanned by Frank O'Brien. Our thanks to Joe Kosmo at the NASA Johnson Space Center for providing access to the PLSS model. Clicking on any of the thumbnail images will bring up the full sized picture in a new browser window. First, high level diagrams of the PLSS and its major components can be seen here: . It may be useful to refer back to them when looking at the detailed photographs to put the components into their proper perspective. Although the PLSS is composed of three distinct systems, the phrase "PLSS" is frequently used to refer to all three components. 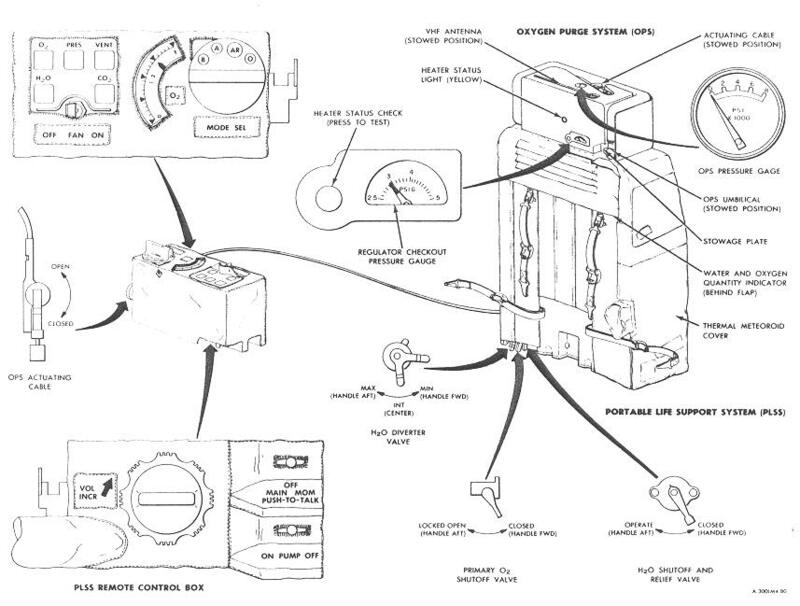 This diagram shows the major components of the PLSS, plus the controls and displays. 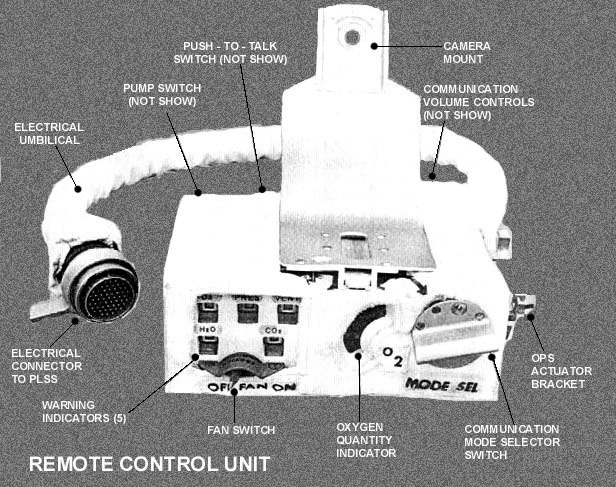 There are three major components: The Portable Life Support System (PLSS) itself, the Oxygen Purge System (OPS) and the chest mounted Remote Control Unit (RCU). On the PLSS itself, the major controls are located on the front, right-hand corner. Moving inboard, these are the water diverter valve, the primary O2 shutoff valve, and the water shutoff and relief valve. These valves were close to one another and often difficult to reach. Frequently, assistance from the other crewmember was necessary to operate the valves. 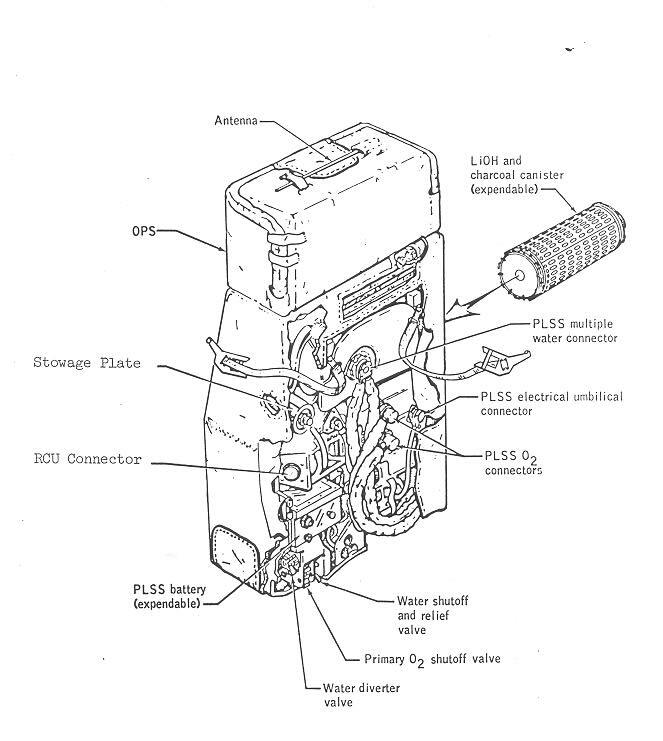 (119k; jpg) A schematic diagram (left) shows the individual components of the PLSS, OPS and the RCU. 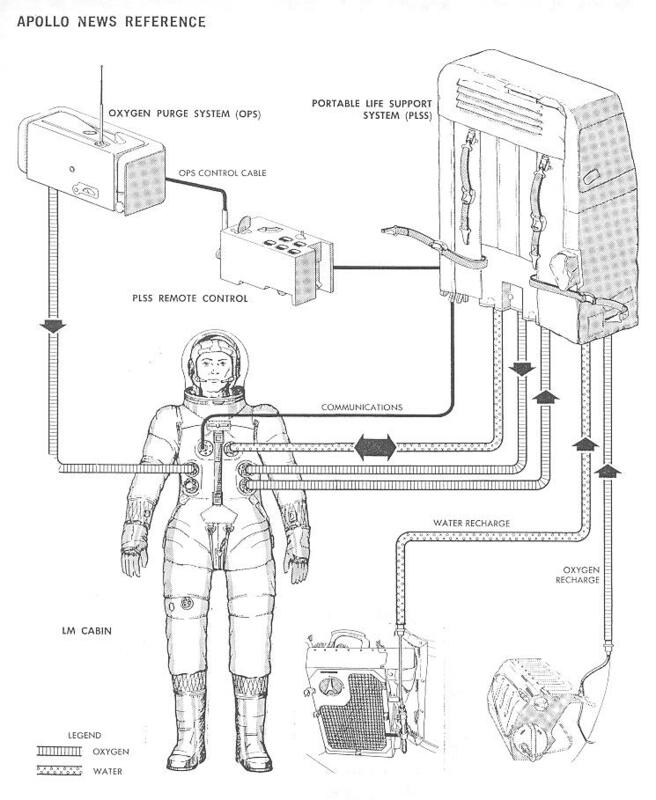 This diagram is especially useful in understanding the flows of water and oxygen between the PLSS and the suit. 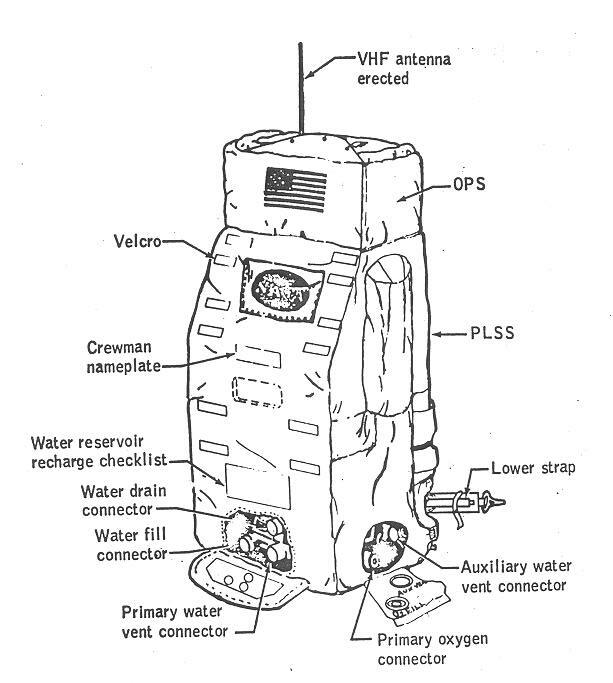 An additional view (right) of the connections between the suit and the PLSS/OPS/RCU with power, water, oxygen and communication umbilicals. Mauro Freschi Furlan has provided a clearly-labeled view of the readouts on the top surface of the RCU. The water diverter valve is used to regulate cooling by diverting water circulating in the Water Transport Loop to the sublimator. Three positions were available which regulated the amount of water sent to the sublimator. The Minimum setting diverted the least amount of water to the sublimator, and circulated water between 75 and 80 degrees. In the Intermediate setting, water entering the suit circuit was between 60 and 65 degrees. When set to the Maximum setting, diverting the most amount of water to the sublimator (resulting in maximum cooling), the water was at 40 to 45 degrees. Most of the time, the crewmember kept the setting at minimum cooling, with intermediate cooling used during periods of exertion. Cooling was especially effective at the higher settings. Apollo 16 astronaut John Young remarked that he was "freezing" at the intermediate setting while he was resting. The second, middle valve on the PLSS is the O2 shutoff valve. 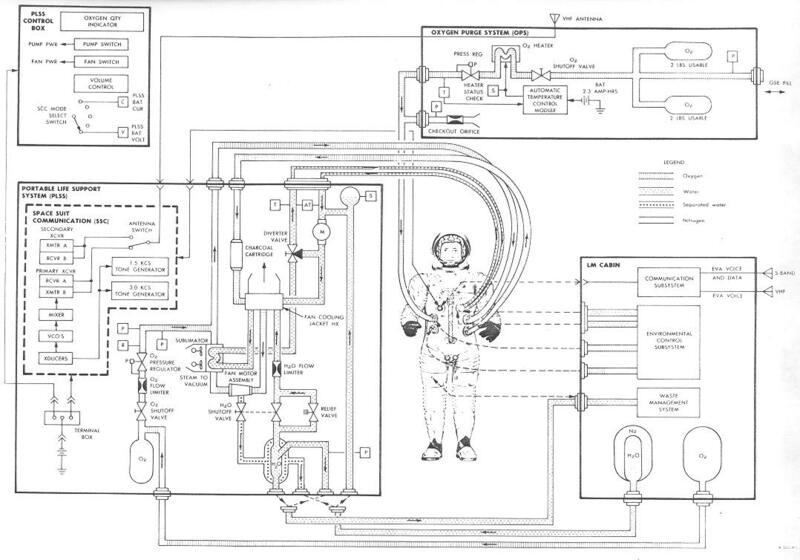 When opened, it allowed oxygen to flow from the high-pressure cylinders in the PLSS, through a flow limiter and the pressure regulator, and into the suit. Once the oxygen shutoff valve was opened, the pressure regulator automatically maintained a suit pressure of about 3.7 PSI. The third and innermost valve was the water shutoff and relief valve. When opened, it allowed water to flow from the water reservoir into the water transport loop. This valve had only two settings, open and close, which controlled the flow of water between the PLSS and suit (remember, the actual temperature of the water was regulated by the water diverter valve). 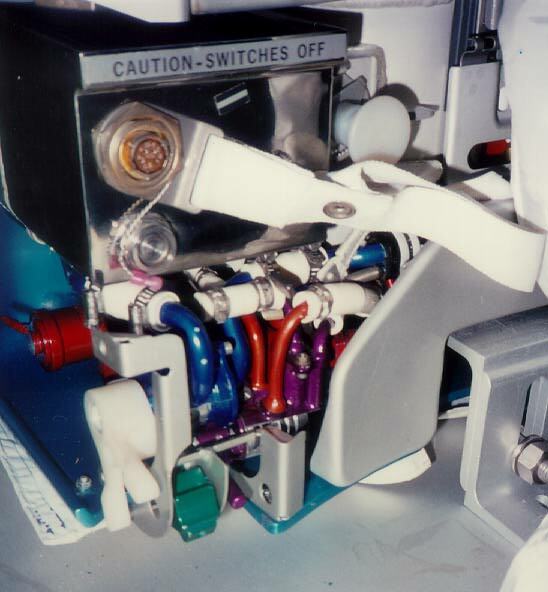 Behind the PLSS control valves, and on the lower left-hand side is the Primary Oxygen Connector. 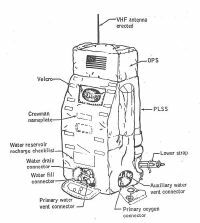 Used to recharge the PLSS oxygen bottles from the LM descent stage supply. These connectors, like all other recharge stations, were hidden under a flap to protect it from micrometeoroids and thermal stresses. Around to the backside of the PLSS, on the bottom, is the water recharge station. Like the Oxygen recharge, cooling water was supplied from tanks in the descent stage. Waste water, which was condensed from the water vapor in the oxygen loop, was drained during the recharge cycle, and stored in the LM wastewater tank. Above the three control valves is the PLSS battery. 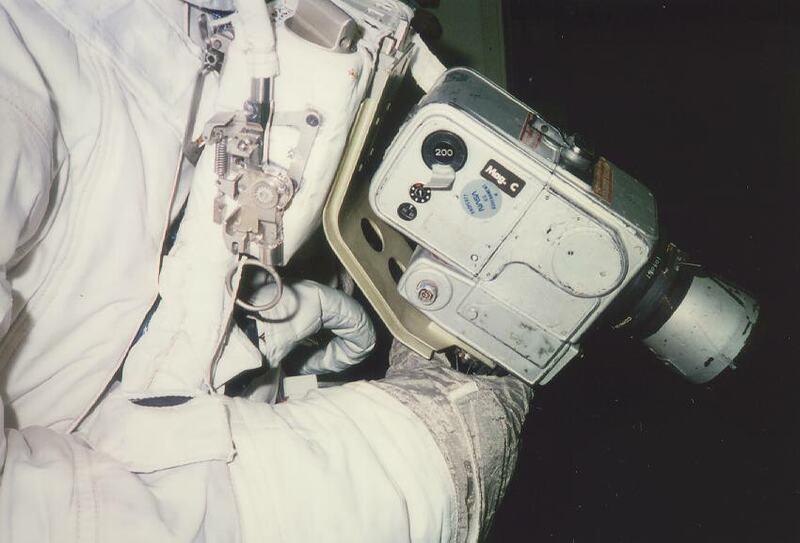 Each battery had sufficient capacity for a single EVA. The first battery, installed before launch, is changed before the second EVA as part of the EVA prep procedure. 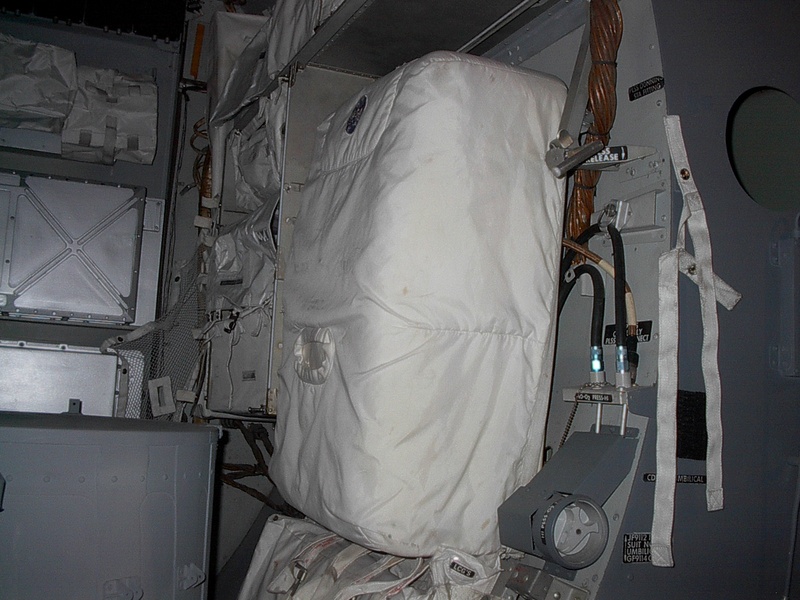 Spare batteries were stored in the MESA, and a fresh set was brought into the cabin as part of the EVA close-out activities. On the side opposite the control valves (on the crewmember's left-hand side; our right) and at the top of the PLSS is where the lithium hydroxide canister is installed. The canister is installed lengthwise into its receptacle, and a cover created an airtight seal for the assembly. Like the batteries, a fresh lithium hydroxide canister was loaded in the PLSS before launch, and fresh canisters were stored in the MESA. Four straps secured the PLSS directly to the astronauts' suit. Looped straps, such as those found on traditional backpacks on Earth, would be unmanageable with the stiff and awkward suits. Instead, each strap ended with a latching clip. 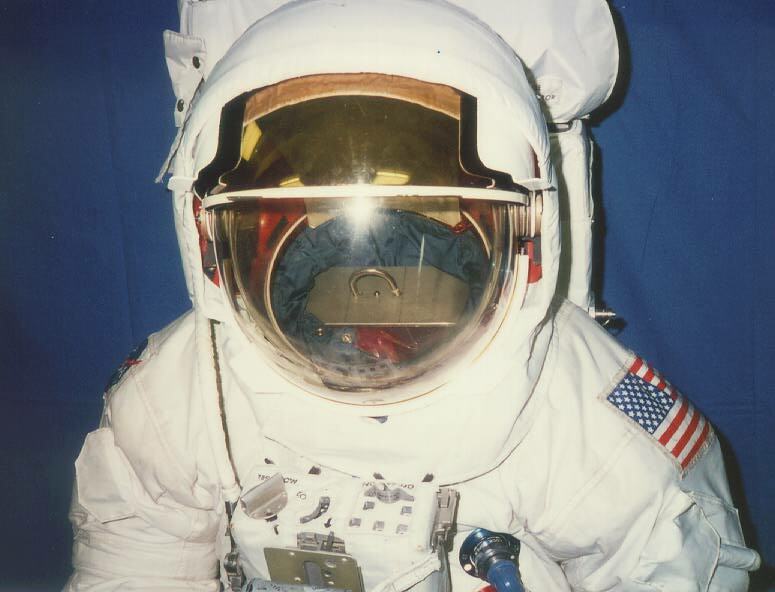 Shoulder straps were connected to a ring assembly on the upper chest of the suit and carried the majority of the weight of the PLSS. 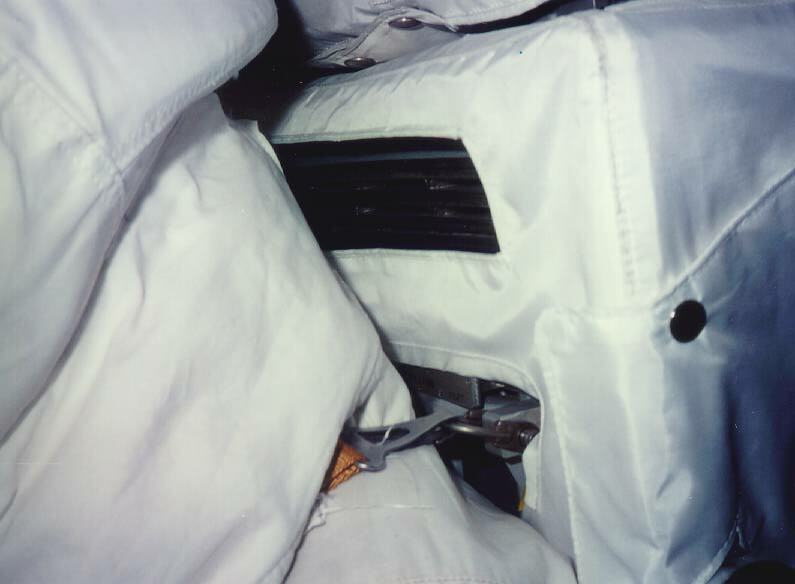 The lower straps, used for maintaining lateral stability of the PLSS, were connected to rings just above each hip. The length of each strap could be adjusted to ensure optimum fit. Fully charged PLSSs were loaded onto the LM before launch, which saved considerable time before the first EVA. For subsequent EVAs, the crews retrieved fresh batteries and lithium hydroxide canisters during EVA close-out activities for use the next day. Recharging the PLSS was a six-step process. Usually done as part of the EVA prep, a few crews used spare time at the end of their workday to replenish the PLSS consumables. The process took about 30 minutes for each suit, and each crewmember worked on their own equipment. By staggering tasks, the entire process took less than an hour. First, the battery and the lithium hydroxide canister were exchanged for fresh units. Used batteries and canisters were stored in large bags that were thrown under the descent stage at the beginning of the next day's EVA, or jettisoned out the front hatch after the last EVA of the mission. Next, oxygen cylinders in the PLSSs were charged from the descent stage high-pressure oxygen supply in a two step process. First, a charge that filled the PLSS O2 cylinders to about 90% capacity was performed. After a few minutes (to allow the cylinders to cool), the O2 supply was "topped off" to about 95% to 98%. Finally, a three-step procedure was used to service the water management system. Step 1 was to recharge the cooling water supply. Draining the waste water was the second step, and the third step was to vent out the excess gas from the cooling water system. Bubbles formed by such gas could interfere with the flow of cooling water in the suit. During the trip out from Earth and during the landing, the LMP's PLSS was attached to the floor immediately aft of the forward hatch. The photo was taken by Frank and Stacey O'Brien in 2002 at the Cradle of Aviation Museum. CDR's PLSS was secured to the side bulkhead behind his flight station. The photo shows a view toward the back of the cabin and was taken by Frank and Stacey O'Brien in 2002 at the Cradle of Aviation Museum. A release handle is visible in the larger version of the image. 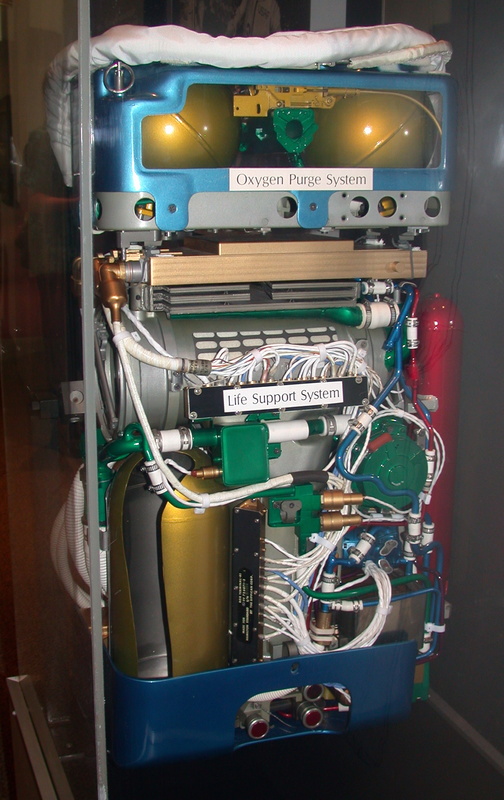 The two oxygen spheres of the Oxygen Purge System (OPS), plus their regulator, are seen within the blue-framed structure. 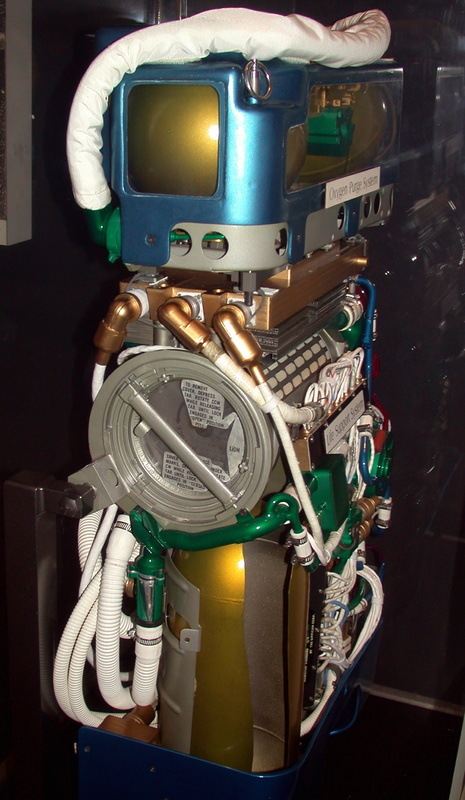 The OPS pressure gauge (in green) can be seen underneath the right-hand oxygen sphere. The OPS was entirely separate from the PLSS, and was intended for emergency use should the PLSS fail. The horizontal blue plates provided mounting points for the OPS to the PLSS. 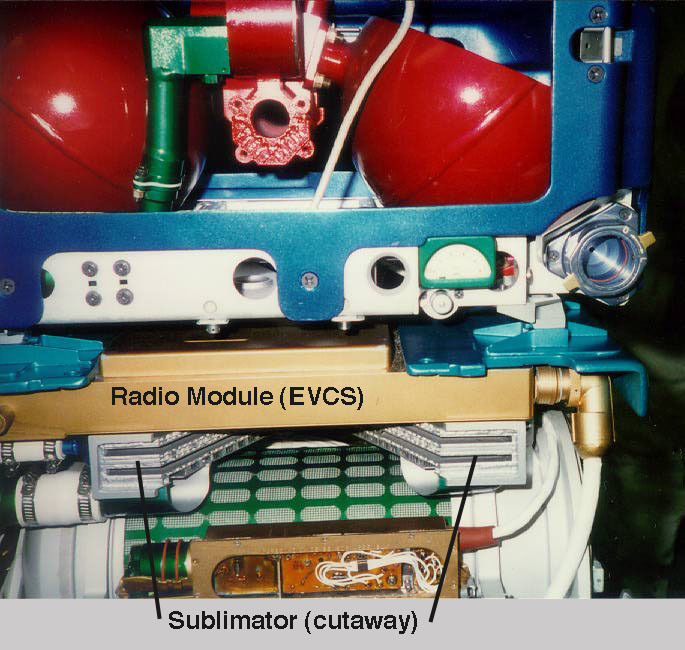 Underneath the OPS is the Extravehicular Communications System (EVCS or radio module) (horizontal , two-segment gold box) and the heat-exchanger/sublimator (silver, shown as a cutaway). 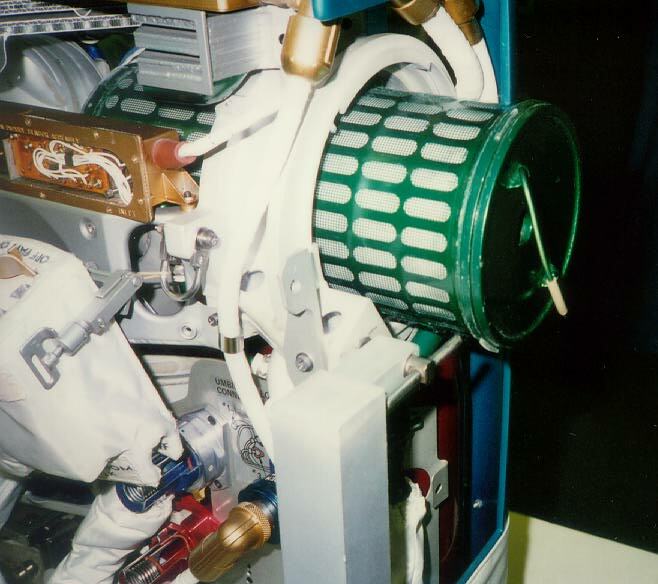 The lithium hydroxide canister can bee seen in green and white, underneath and behind the sublimator. A lithium hydroxide canister is shown being inserted into the PLSS. Part of the oxygen return loop, lithium hydroxide was used to "scrub" exhaled carbon dioxide for the oxygen stream. The opening for the canister is approximately at shoulder level on the astronaut's left-hand side of the PLSS. Note that in this engineering model, the canister can be seen inside the PLSS. On production models, this chamber is totally enclosed. Astronaut's right-hand side of the PLSS The "front" of the PLSS is to our left. The round white cover of the lithium hydroxide canister holder can be seen at center. 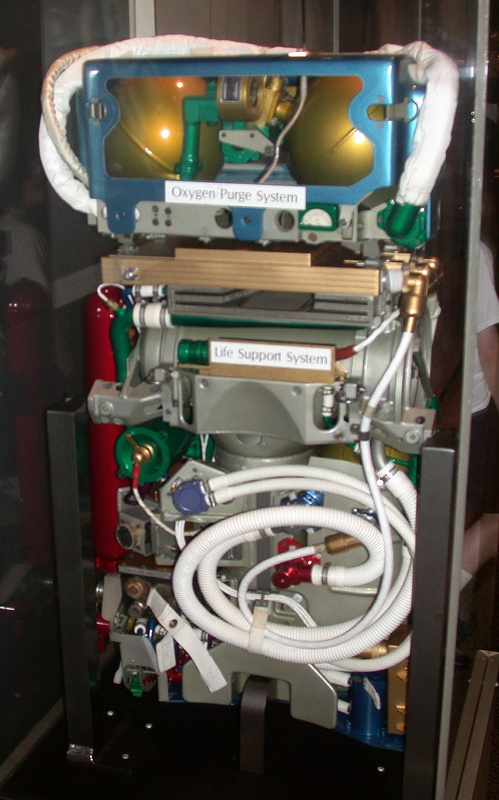 Below the canister holder, in red, is one of the two PLSS oxygen cylinders. The PLSSs (and the LM as well) stores of compressed, high pressure oxygen for breathing. Liquid oxygen was not used as a source for breathing oxygen because of the complexity and weight required for storing and managing cryogenics. 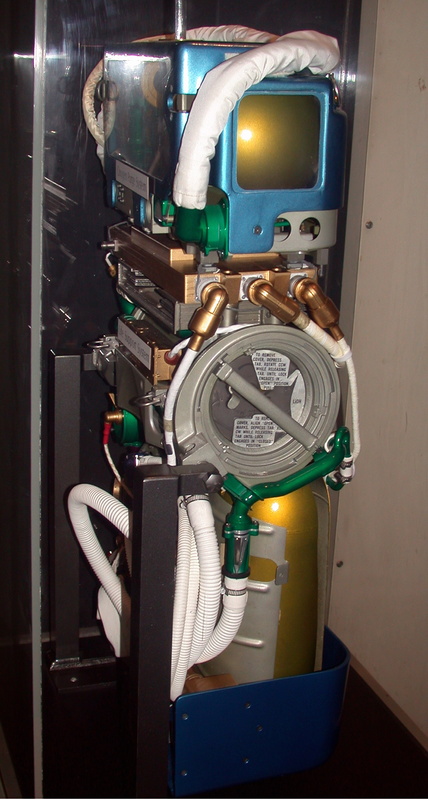 The two hoses to our right of the PLSS oxygen cylinder are the supply hose (connected to the green oxygen manifold) and the return hose, which is connected to the heat-exchanger/sublimator (hidden), and to the lithium hydroxide canister. Water recharge station. On the lower, back side of the PLSS are the fittings for the cooling feedwater and waste water storage vessels. 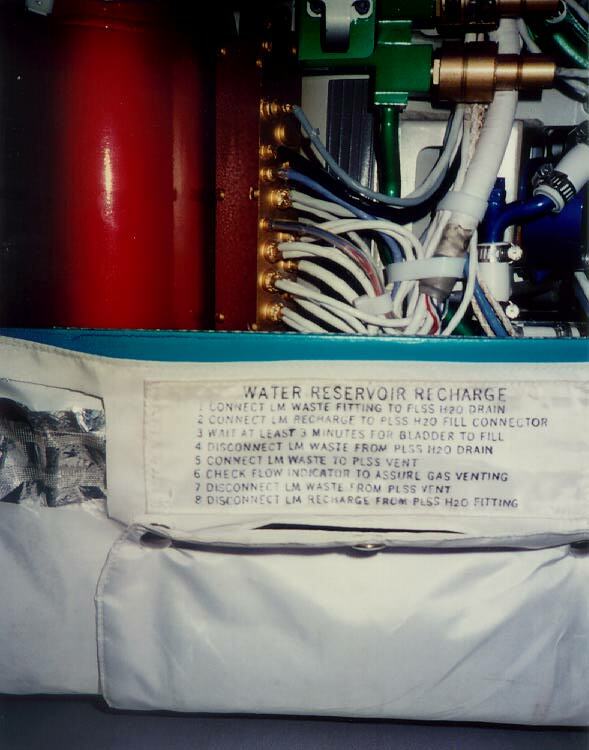 Water flow control module, located on the lower, forward corner of the PLSS. 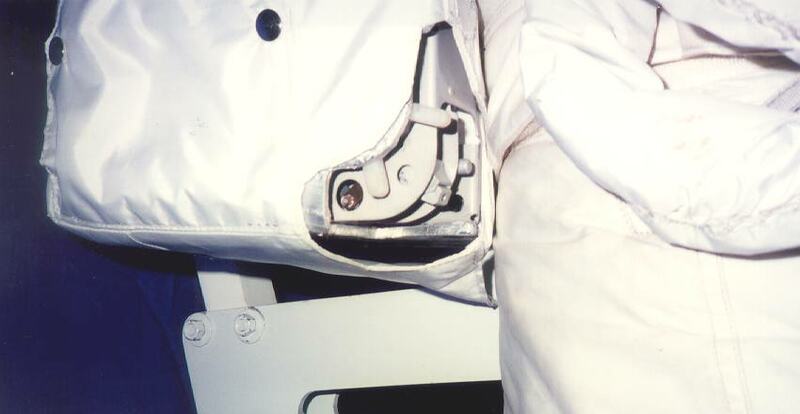 The flow control valve, used to adjust the level of cooling within the suit is the white, two-pronged lever on the astronaut's right side of the assembly. The astronaut can reach this lever with his right hand. Side view of the water flow control assembly. The flow control valve used to adjust cooling levels is at our lower right. Astronaut's left side shoulder harness PLSS attachment. The strap passes through a sleeve that runs from the top ofthe shoulder to the upper chest attachment point. 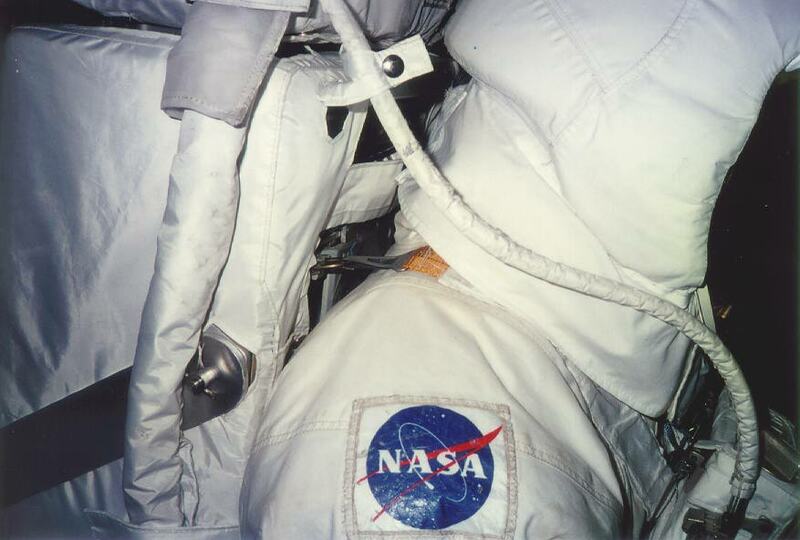 This sleeve is hidden by the hood used to cover the astronaut's helmet. 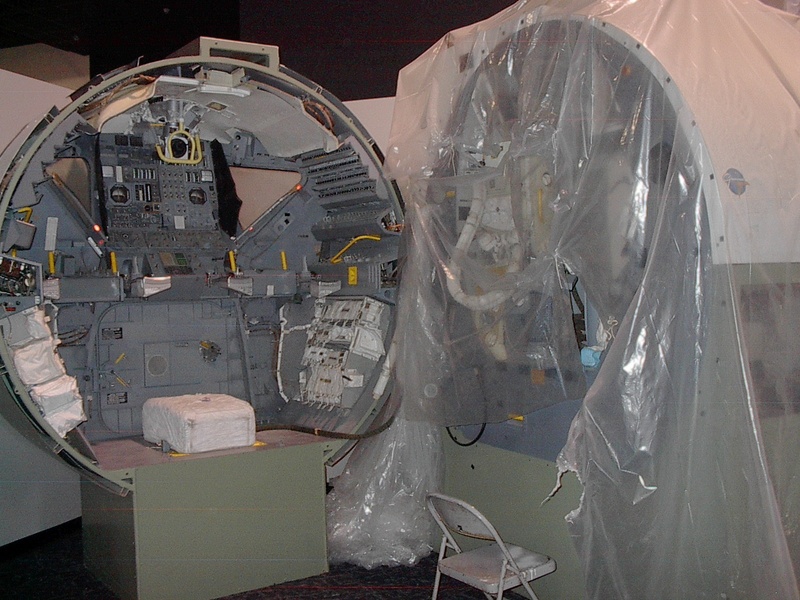 The cutout section in the upper part of the PLSS is part of the display, and is not a characteristic of PLSSs that were used on actual missions. 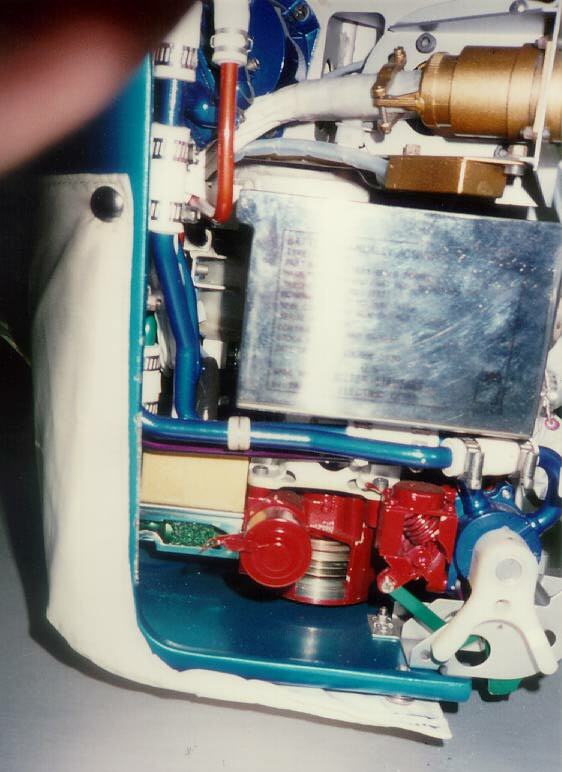 Close-up of the water flow control valve on the astronaut's front, right-hand side of the PLSS is shown on the left. The metal bracket underneath the PLSS is to support the unit for display. The picture on the right shows the astronaut's right-hand side of the suit and PLSS The bottom edge of the OPS is visible in the upper left of the picture. Passing over the suits' shoulder is the cable connecting the Remote Control Unit with the PLSS and OPS. The hose along the side of the PLSS carries oxygen from the OPS. The metal bracket is part of the display. Hasselblad camera and mounting bracket. Connected to the front of the RCU, it allowed hands-free carrying and pointing. A trigger on its pistol grip (hidden from view by the glove) controlled the shutter. Interchangeable film magazines (magazine C shown here) allowed easy switching between various rolls of film. Visor and side shade details are visible in this photograph. Note the oversized tabs used to raise and lower the gold-coated visor and the opaque side shades. The bracket inside the neck ring of the suit is the hanger used when the suit is in storage. 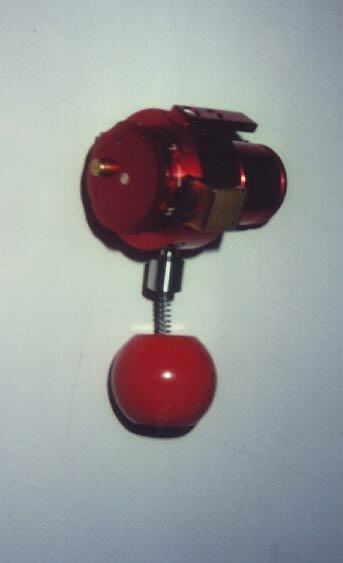 The "Red Apple" with which a safety could be pulled from the Oxygen Purge Valve, which was located on the astronaut's front right side of the suit. 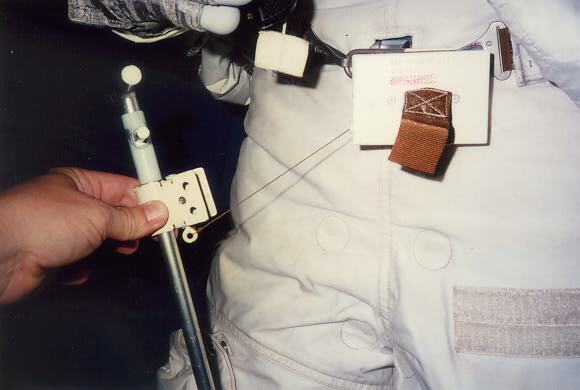 Once the pin was pulled, the astronaut could then open the valve. The valve would only be opened in the event of a PLSS failure. 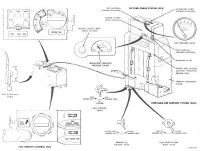 Should such a failure occur, the astronaut would activate the Oxygen Purge System, using a lever on the side of the RCU, and then would open the valve to establish a pressure gradient to drive the flow of oxygen. Oxygen would flow into the suit from the OPS tanks and then out the valve. These photographs were taken by Ulli Lotzmann at Air and Space in October 2004. Click on the images for larger versions. Lithium hydroxide: canister increased to hold 3.12 pounds of LiOH, up from 3.0 pounds. The capacity of the OPS was not changed, and remained at about 30 minutes of oxygen for breathing and cooling. 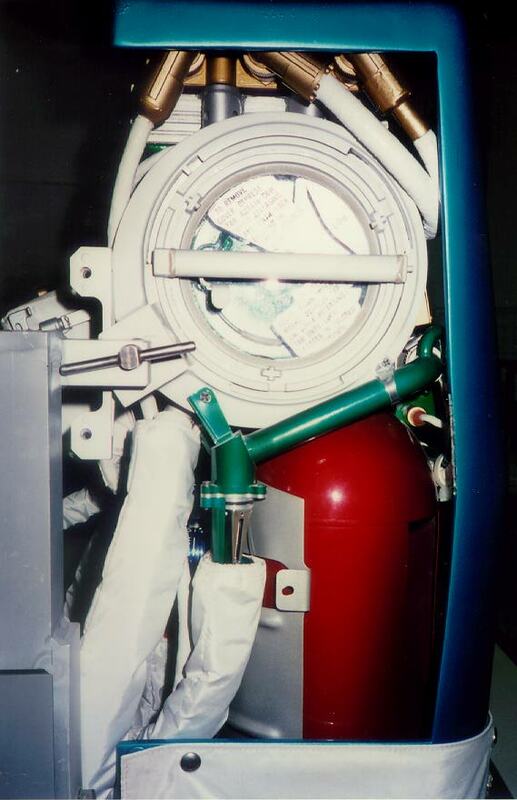 When combined with the Buddy Secondary Life Support System, which used the functional PLSS for cooling, the OPS could supply oxygen for 75 to 90 minutes.